It's become a piece of orthodoxy because of its truth: the early to mid-80s were a golden age for British singles. From the last ragings of punk into post-punk, then 2-Tone and the ska revival, into the new romantics and new pop, and then the glorious, miraculous blossoming of The Smiths, there was a period of seven or so years in which British groups seemed to release singles like benificent explorers returning home laden with trinkets and gold to dispense to a grateful populace: here, people, have 'Funeral Pyre'! You, boy, take 'Ghost Town'! Who wishes for 'This Charming Man'? In retrospect, the first years of that decade now look like an anomaly. Overall sales of music had been declining in the late 70s – the UK saw a 26.4% drop in music sales between 1977 and 1980, according to a 1983 paper in the journal Popular Music – and album sales would only start recovering as the Walkman became commonplace, and the CD was launched, compensating for the market saturation of vinyl. But short-form, music was thriving in the new decade, with single sales booming worldwide: 526m sales in 1980, 550m in 1981, 580m in 1982, then peaking at 800m in 1983 before dropping away again and falling below 400m in 1987 (singles sales wouldn't pick up again until the mid-2000s, and the advent of downloading). In the early 1980s, if you wanted to be noticed, you had to be a singles band. Metal and hard rock had, traditionally, viewed the single as an adjunct to the serious business of making bold statements over 35 minutes or more. In the UK, Led Zeppelin hadn't bothered with singles at all; Black Sabbath reached No 4 in 1970 with 'Paranoid', but didn't turn up in the charts for another eight years, when 'Never Say Die' made it to No 21. Then, as the 70s drew to a close, that changed. It wasn't just that the singles market started booming, it was also that metal itself changed. The new wave of British heavy metal produced an array of bands who were comfortable with getting their message across in four minutes or less, groups who had taken notice of punk and the rise of independent labels, and – whether or not they had any sympathy for indie music – recognised the opportunity they had from self-releasing, or from going with small labels like Neat or Heavy Metal, labels that saw the benefits of getting bands to record a couple of tracks for singles or compilations, rather than packing them off for six months to make their masterpiece. Established bands noticed the change in the prevailing winds, too. Judas Priest completed their metamorphosis from noodling-prone, blues-based heavy rockers to a group who understood that if you looked dramatic and could give fans memorable verses, a great chorus and a solo that did just enough, then those fans would multiply in number. With Ronnie James Dio replacing Ozzy Osbourne, Sabbath got distinctly less meandering, and re-established themselves as visitors to the charts. But the bands who made the greatest impact were those with a bit of major label muscle behind them, and who realised singles needed to be standalone statements of themselves. Saxon, who were Top Of The Pops regulars for a couple of years; Gillan, who saw no shame in putting out heavied-up rock & roll and even soul covers to keep themselves in the charts; Def Leppard, who had a much keener appreciation of what it took to become huge than any of their contemporaries; and Iron Maiden. It seems faintly ridiculous to posit Iron Maiden alongside The Jam, The Specials, Madness, The Smiths and the other great singles bands on 35 years ago, but that is what they were, until singles stopped mattering so much, and the album was reestablished as the definitive statement. Even then, owing to the huge size of their fanbase, their singles continued to be big deals: as recently as 2006, 'Different World' reached No 3. Their pomp as a singles band, though, was the 80s, ending with the group's sole UK No 1,' Bring Your Daughter … To the Slaughter' in 1990. Maiden did all the things great singles bands do: they released songs that were concise and dramatic, that introduced to their world without the need for the context of an album; they released singles that did not feature on the albums of the same time ('Sanctuary', 'Women In Uniform', 'Twilight Zone'); their singles were definitive statements, songs that everyone knows and which still get the biggest crowd response at shows ('Run To The Hills', 'The Trooper'). As a kid, going to see Maiden at Hammersmith Odeon on the World Piece tour and the World Slavery tour in 1983 and 1984, I didn't think about any of that. For reasons now lost to time, I believed the quality of a song was directly proportional to its length, something a great many hard rock and prog bands also appeared to believe. So the songs I wanted to hear back then were not 'Run To The Hills' or 'Prowler' or 'Twilight Zone', but 'Rime Of The Ancient Mariner' or 'Hallowed Be Thy Name', and Maiden were always happy to oblige with the epics. These days, in middle age, I feel rather differently, that there's barely a ten-minute song that can't be improved by shaving seven minutes off it. Roxette, now, are my gurus: Don't bore us, get to the chorus. 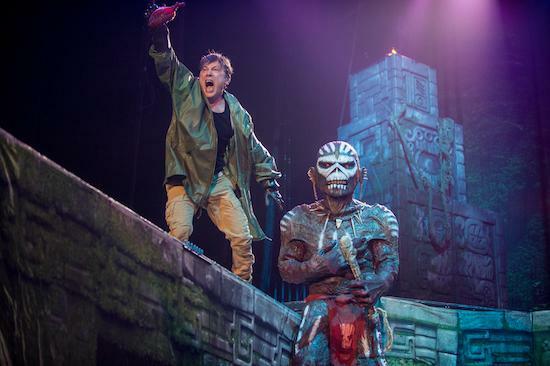 More than 30 years later, as Maiden bring their Book Of Souls tour to the UK – their only British show last year, when the tour began, was at Download – nothing has changed. In fact, anyone transported in time from 1984 to 2017 would be surprised only that the band all look significantly older. Everything else is the same: the stage set is still the same high-concept, moderate budget playground for singer Bruce Dickinson to rampage around, and you'll look in vain for cutting-edge technological effects (just as on the World Slavery tour, the backdrops change; and there are some fire pots and a lot of dry ice, but that's about it). That's the way the crowd at the Motorpoint Arena in Nottingham like it, though, it seems. If hard rock bands have long claimed to be people's groups, then Maiden press the claim harder than most. 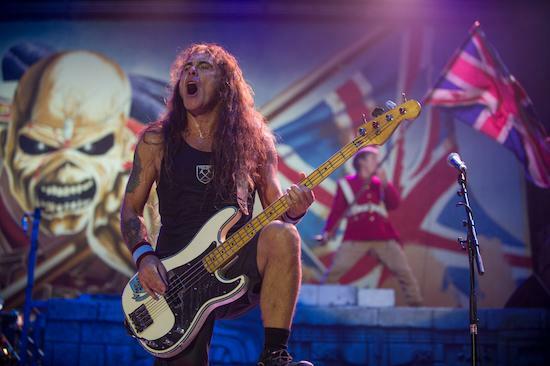 For much of the show, Dickinson, bassist Steve Harris, and guitarists Adrian Smith, Dave Murray and Janick Gers are lined up at the lip of the stage, in front of their monitors, reducing the distance between them and their crowd as much as they can. And the show is, of course, as close to family entertainment as you can get given the content of the songs: as Dickinson observes at one point, it's a little ironic that all those songs about mass murderers have attracted the most peaceable of crowds. The singer, as he has done every show for decades, bellows "Scream for me!" every few minutes; one suspects that at this point in his life, it's a kind of rock & roll Tourettes, that the words come out whether or not he even realises he's saying them. There are inflatable Eddies, directed singalongs, and lowest budget but most compelling of all, the peculiar stage presence of Gers, whose idea of stagecraft is to stretch a leg out to rest on the stage side monitor, like some flightless bird at rest, and then to perform odd little pirouettes and prances around the stage. I suspect he spends less time playing his guitar than twirling it. Naturally, the crowd adore it. The 10,000 or so in the arena – a huge proportion displaying their loyalty in the form of T-shirts, the significant number of women no less likely than the men to be wearing those shirts – believe Maiden can do no wrong. They do not desert the room en masse for the bars and toilets when Maiden play two songs in a row – the best part of 18 minutes – from The Book Of Souls. Metal is built on its reliability. 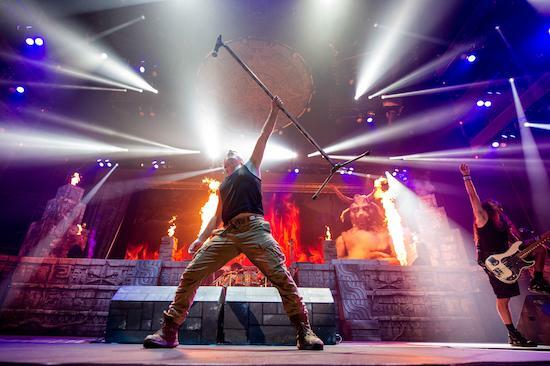 The metal bands who, like Maiden, have survived for decades have done so because they offer guarantees, principal among them the guarantee that you will not be surprised. When they rescind that guarantee and try to offer novelty, things go wrong. Maiden realised that after their flirtation with Blaze Bayley (outside the arena, I notice one family in which dad and son, both in denim jackets, have supplemented their huge Maiden patches with rather smaller Bayley patches, displaying the loyal-at-all-costs attitude that characterises the most determined metal fans), and these days they make no pretence at trying to challenge. Iron Maiden are a monolith; they simply exist on terms that have been defined over nearly 40 years by recognising what millions of fans expect and demand of them. At this point, they are beyond criticism, they just are. You might as well admonish the moon for failing to offer much in the way of gravity as suggest to Maiden that there are things they might think about changing. But as the show progresses, one notices that the 'The Book of Souls' gets a slightly less manic reaction than 'The Trooper' or 'Number of the Beast'. Maybe Maiden might consider going against all the orthodoxy of metal and remember that there was a time when they had another identity as one of the great British singles bands. Think of the tour they could put on, in the unlikely event they were so minded: one in which all the epics were set to one side, and no tracks from a new album were aired. Instead of 14 tracks in two hours, they could play 20, maybe more, performing only singles. It need not be dull for them – many of those songs have been out of their setlist for decades – and it certainly wouldn't be dull for the audience. It might be surprising, which – as we have already ascertained – is not always a great thing for a metal band, but it would be glorious, a romp through the catalogue never to be forgotten. Maybe my other idea, for a joint tour with one of the other great British singles bands, might be a stretch too far at this point. A bit too end of the pier. But at least the tour name would be great: Can I play with Madness?